I didn’t make this copper banded hardware bin, but I made it better. 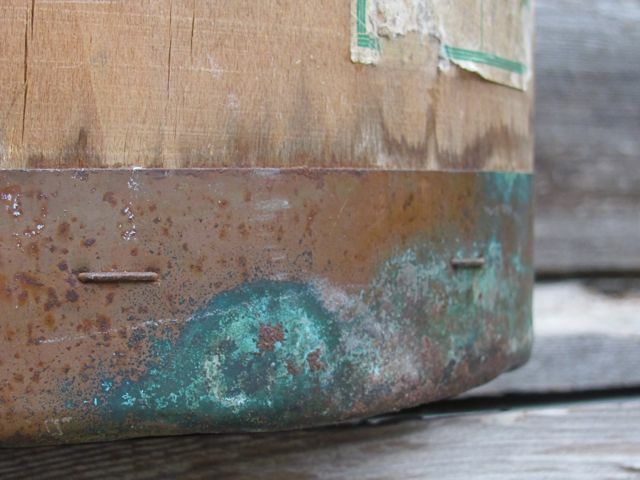 All this gorgeous aging is natural. I made it better by repairing and refreshing the bottom. 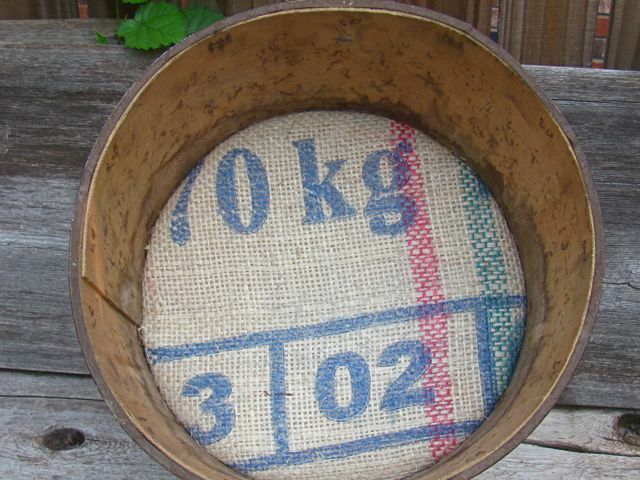 After filling thin spots in the bottom with wood filler, I covered a false bottom with a burlap coffee bag to tidy up the looks. It’s for sale in my shop, The Little Blue Trunk on Etsy. If you have a cat she’ll claim it for her own, otherwise it’s ideal for holding magazines, newspapers, TV remotes, game controllers, dog toys, balls of yarn, fabric scraps, embroidery projects, building blocks, Legos, and who knows what else! I’m going to miss it when it sells! I am going to list some paper products in the Little Blue Trunk. No, not toilet paper or paper towels. Ephemera refers to vintage paper products such as postcards, greeting cards, brochures, leaflets, ticket stubs, maps… stuff like that. Oh, and the magazine ads I mentioned in the last post. I have tons of ephemera! 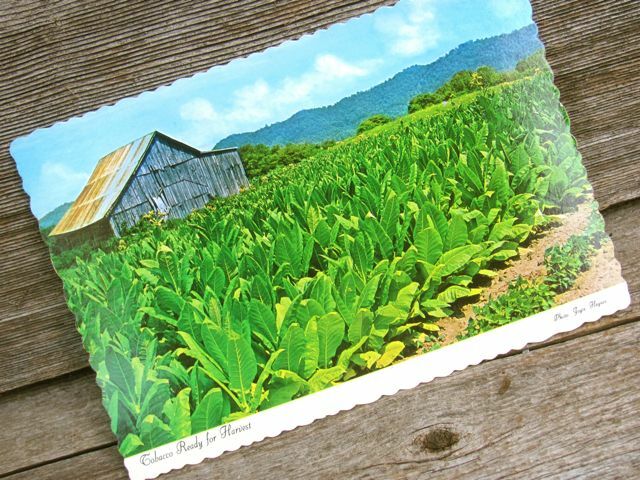 I really like this post card, even though it’s a field of tobacco. Ya gotta love a weathered barn with a rusty tin roof. Then there’s this Christmas card that Joan might send out on Mad Men. 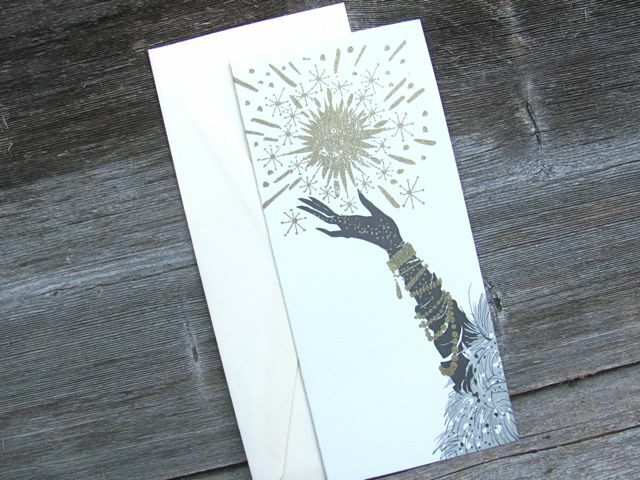 All glitter and sparkles with the evening glove and lots of bangles. 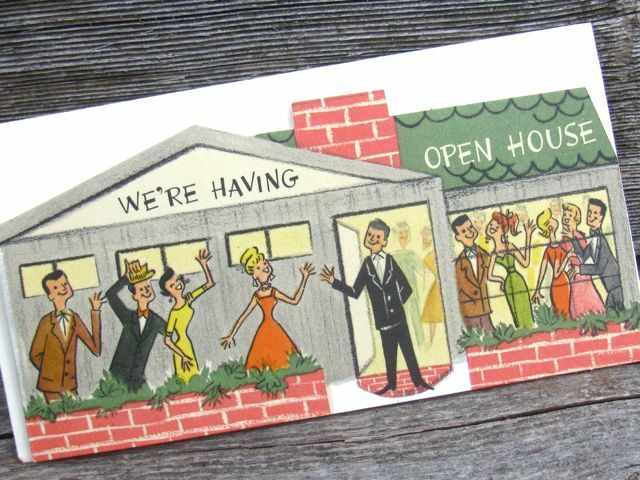 Betty might have used this little open house invitation back when she was married to Don. It’s really small. The post office wouldn’t deliver it today, but you could put a stamp on anything back in the day and get it there. 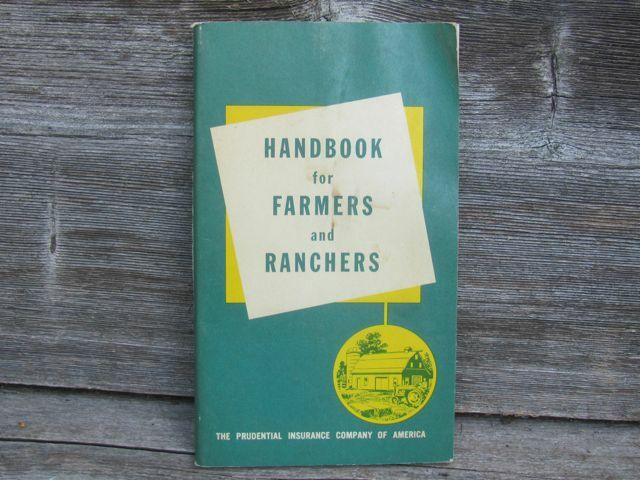 This Handbook for Farmers and Ranchers was distributed by Prudential Insurance. Topics include weights and measures, how much seed to buy, when to plant, when to harvest, how to store vegetables, how to mix concrete, how much lumber to buy, how far paint will spread, when to breed livestock, and how to treat injuries, bites and poisonings, every day stuff like that. Other than some of the first aid it’s still accurate information. I mean, there are still 12 inches in a foot and a mile is still 5280 feet. Right? There’s no copyright, but there’s no mention of meters or kilometers or liters so it was before someone decided America should go global and measure things like the rest of the world. So all in all, unless you have a meter stick instead of a yardstick, it’s a pretty handy little book. 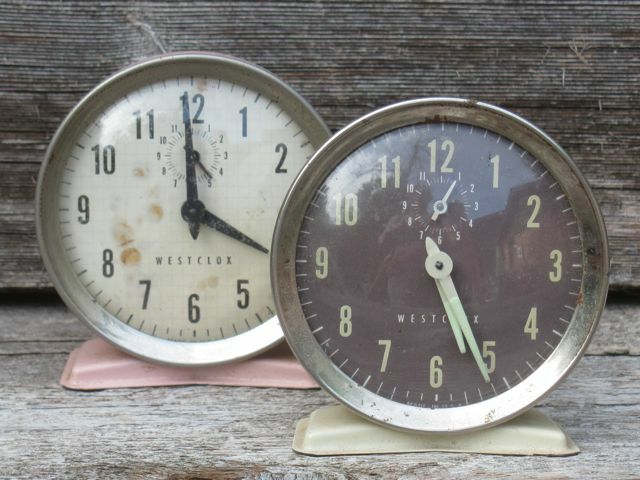 Two cute little wind-up alarm clocks by Westclox. They’ll be on the way to Rhode Island on Monday. By the way, all of these things were acquired from one vendor or another at the flea market. Three weeks, three sales. It’s a start. My following is growing, and lots of people favorite my items and my shop. Now it’s time to concentrate on listing things. I LOVE hats. I wear a hat every opportunity I get. 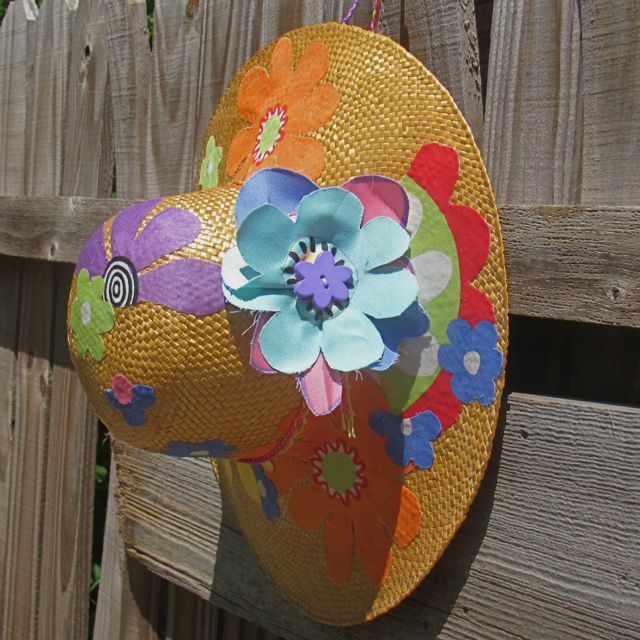 I always wore an Easter bonnet on Easter Sunday, usually made over to match my Easter dress and new patent leather shoes. 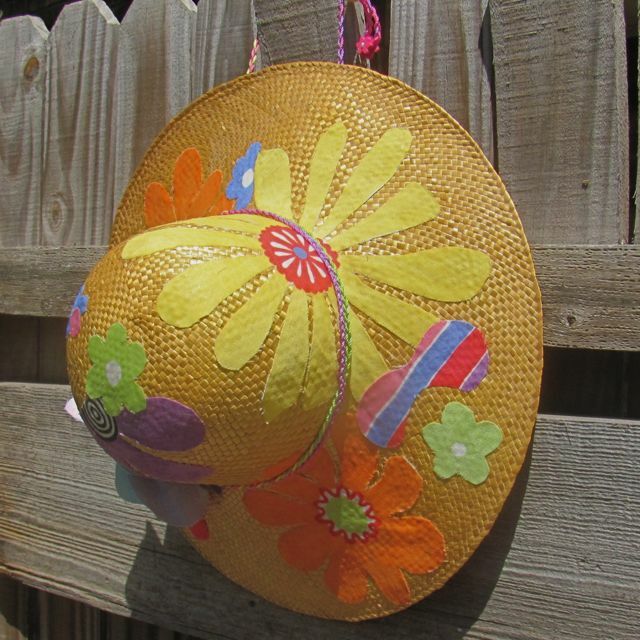 I found a perfectly good straw sun hat recently and it had a slash across the crown. It hadn’t been worn so the slash was invisible, but would fray if it wasn’t repaired or patched. It was the perfect opportunity to experiment. How about that cute little flower? I braided some bright variegated cord to tie around the crown and used the same for a chin strap. 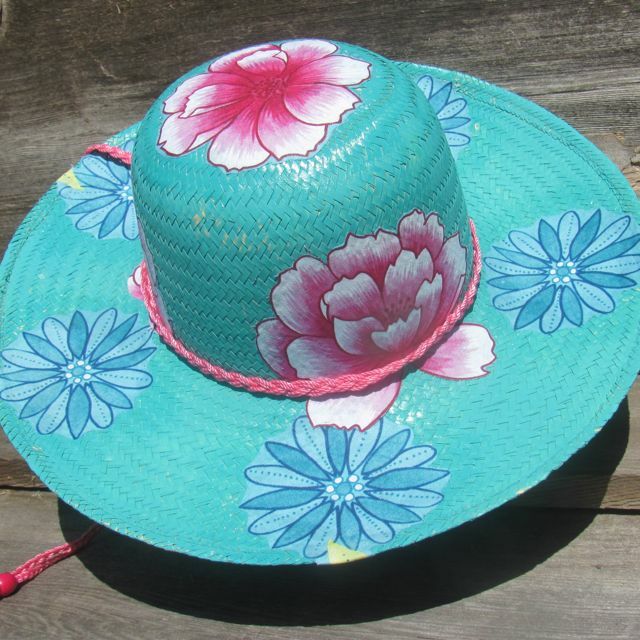 How about hot pink and turquoise? Wish I could wear one everyday, but it’s been cold(ish) and cloudy, so they’re a little out-of-place right now. 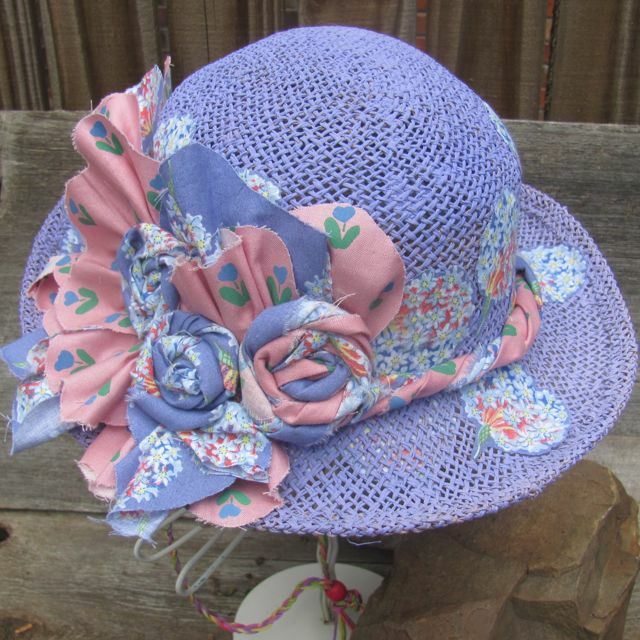 What about this lavender straw hat? 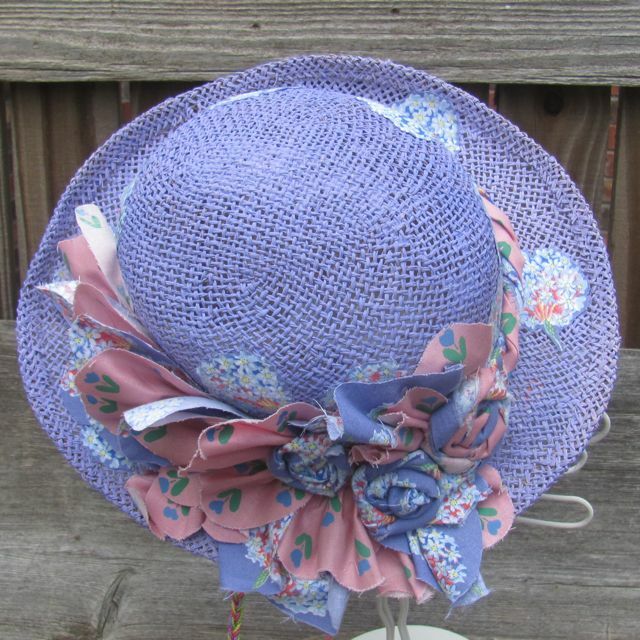 This was a boring little hat, kind of a flat-topped boater style. The crown was caved in, and the straw was kind of limp. When I painted it the crown perked up and it became much less floppy. I picked the color to match the vintage cotton I came across in my stash. After I cut out those little bouquets, I had some curvy edges left on the main piece of fabric. 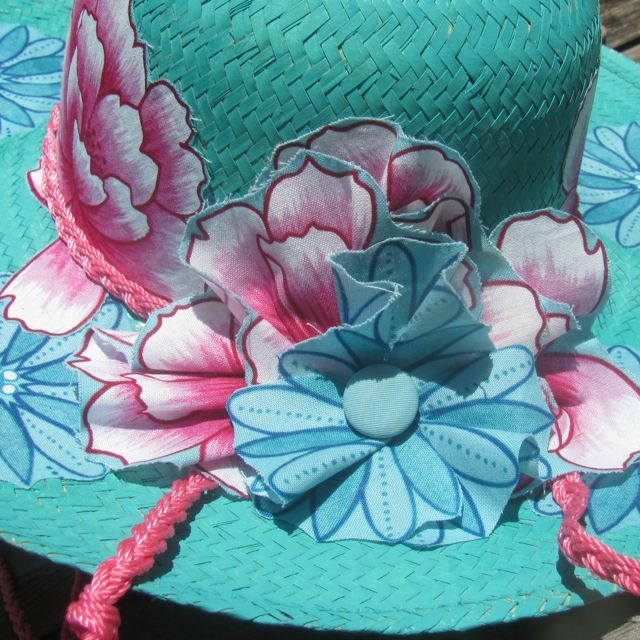 Instead of wasting a scallop, I cut the curves into sections, gathered them into “petals” and stitched them along the hat band. Twisted fabric rosettes covered the raw edges. 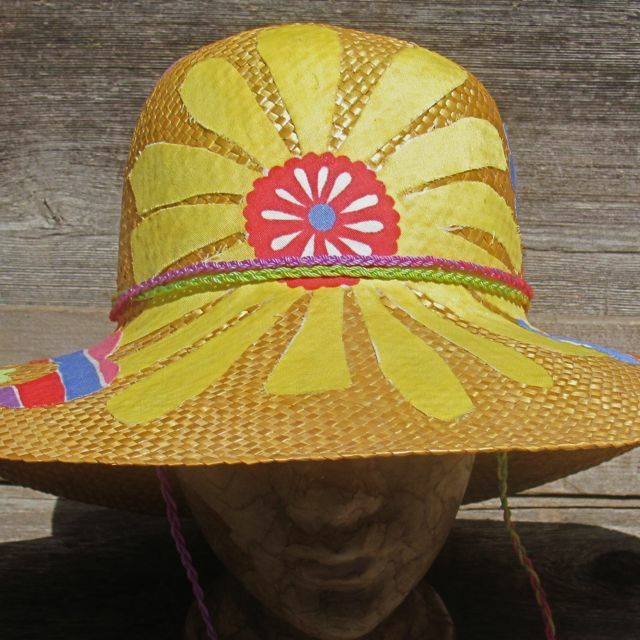 I glued a fabric band around the brim for several reasons. Comfort. A piece of fabric is more wearable than scratchy straw. 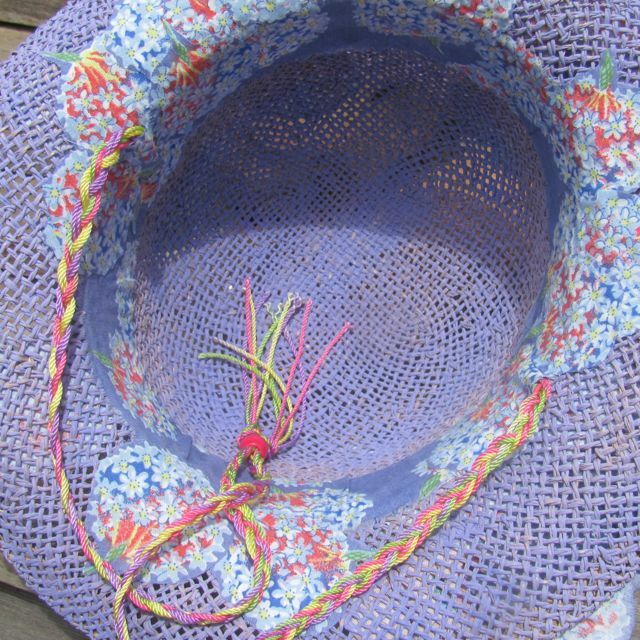 The additional fabric bouquets hide—and secure—the thread used to attach the hat band and flowers on the brim. 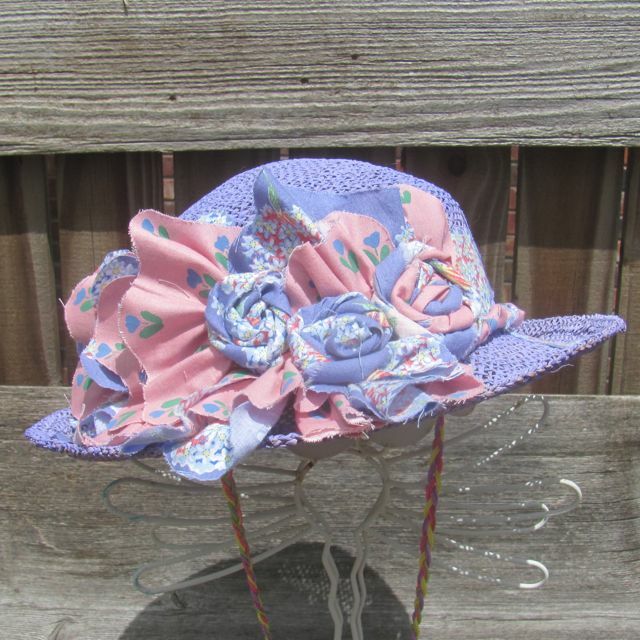 All of the hats have ribbon or fabric inside the brim, and a chin lanyard. Practically a requirement in forever-windy Oklahoma. I’ll take some measurements and list these in my etsy shop. I’ll update this post with a shopping link when I get them online. Be sure you’re a subscriber so you won’t miss what’s coming next! I don’t remember how or when the idea occurred to me, but then my friend Dianna mentioned it, and then I started seeing samples online. 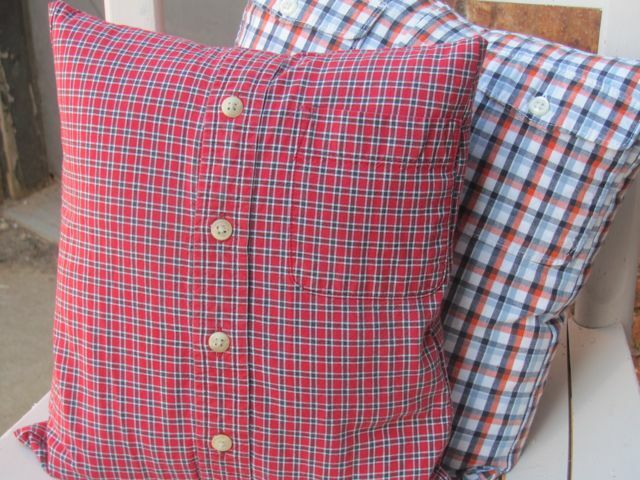 I’m talking about turning shirts into pillows. I pinned it when I came across a couch full of them—and a great tutorial—on Country Living. 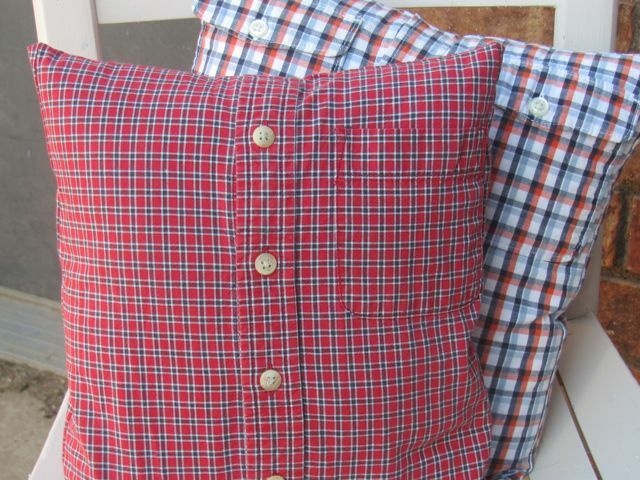 In the tutorial they used adult shirts and cut them down to fit pillow forms of a specific size. But the shirts I planned to use were big-boy plaids for little boys. And the toddler-size didn’t give me room for wide seam allowances and top-stitching and other edge treatments. All I could do was turn the shirts inside out and sew side seams as close to the sleeve as possible without infringing on the little pockets on the chest. The woven plaid made it easy to stitch in a straight line. Next I cut the shoulders away from the body just below the yoke and that became the seam along the top of the pillow. Since Poly fill is so expensive these days, I’m a big fan of recycling old pillows. I’m not talking about old stained, sweaty, smelly pillows, just pillows that are out of style. 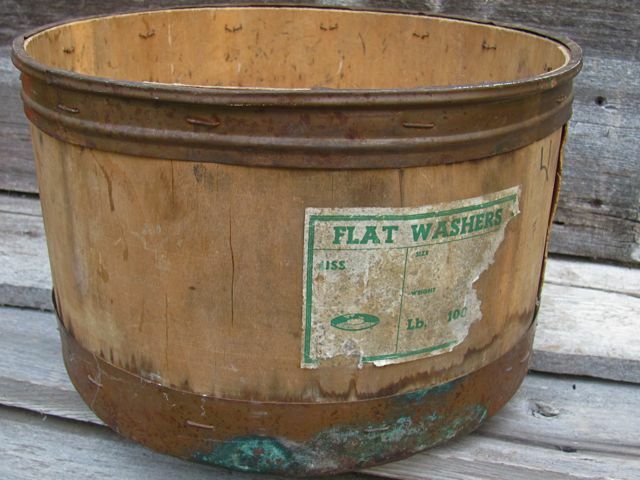 They’re usually only a dollar or two at garage sales and worth the trouble to recycle. First thing is toss them in the washing machine, and then put them in the dryer. No matter what the fabric content, all of them have come out looking amazing, but alas, they’re still out of style. Lightweight cottons and polys can be covered as is, but you’ll want to remove the outer pillowcase on heavier fabrics or if there are embellishments or textures that might show through. To fill the pillows I performed surgery on a couple of small clean old pillows. 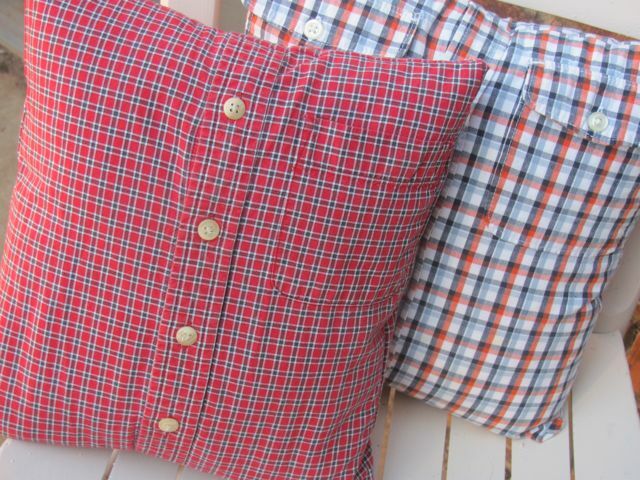 One pillow form was ready-made and it fit nicely into the red plaid. The other pillow was naked inside, so I had to make a lining for it. I found a scrap of white lining fabric which fit the bill. The final step was to turn them inside out and make the final seam across the bottom. Then I unbuttoned the shirt, turned them right side out and crammed the forms inside. Then I smushed and pushed and prodded and smashed everything around to fill in the corners and voila! Two pretty cute little pillows. I haven’t measured these, but they’re just the right size for little naps. What do you think? 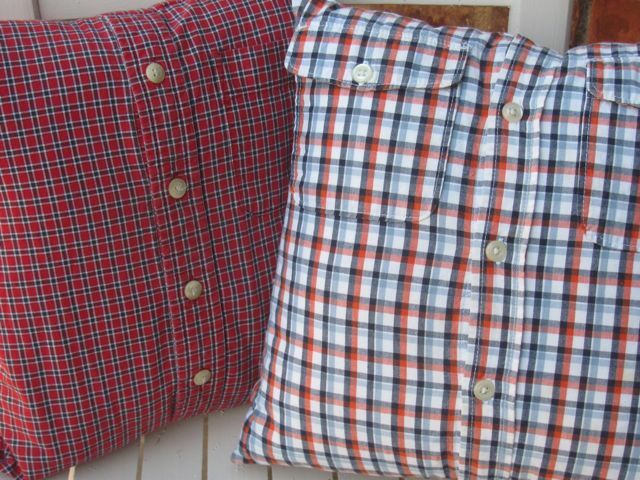 Do you have a special spot for a couple of casual little pillows? By the way, this project is 100% recycled.